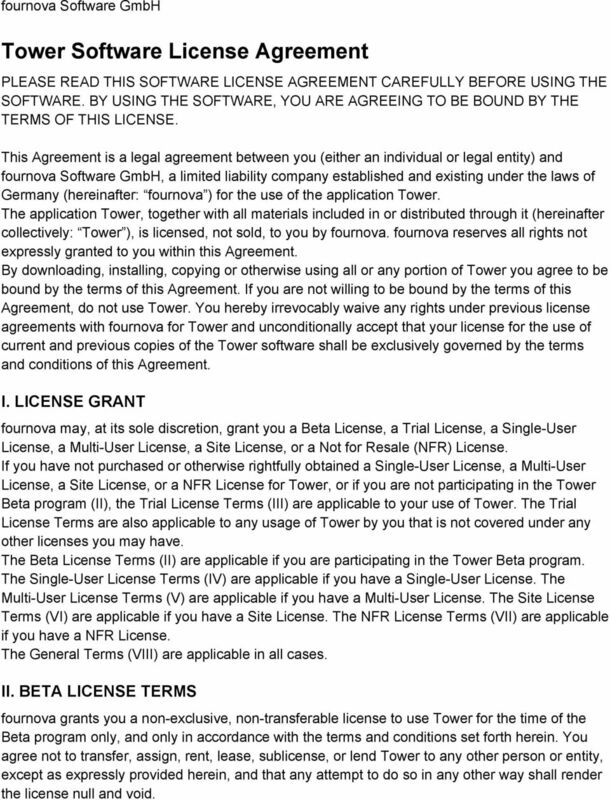 Download "Tower Software License Agreement"
1 fournova Software GmbH Tower Software License Agreement PLEASE READ THIS SOFTWARE LICENSE AGREEMENT CAREFULLY BEFORE USING THE SOFTWARE. BY USING THE SOFTWARE, YOU ARE AGREEING TO BE BOUND BY THE TERMS OF THIS LICENSE. This Agreement is a legal agreement between you (either an individual or legal entity) and fournova Software GmbH, a limited liability company established and existing under the laws of Germany (hereinafter: fournova ) for the use of the application Tower. The application Tower, together with all materials included in or distributed through it (hereinafter collectively: Tower ), is licensed, not sold, to you by fournova. fournova reserves all rights not expressly granted to you within this Agreement. By downloading, installing, copying or otherwise using all or any portion of Tower you agree to be bound by the terms of this Agreement. 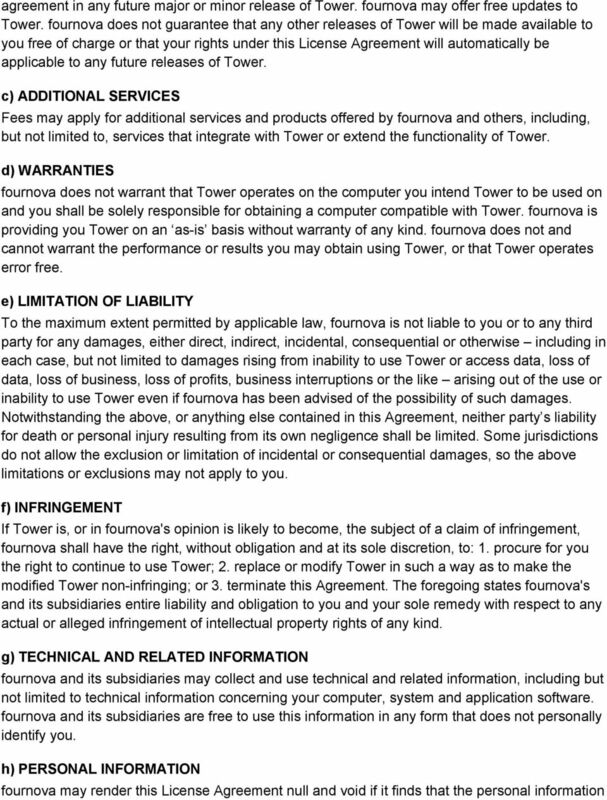 If you are not willing to be bound by the terms of this Agreement, do not use Tower. You hereby irrevocably waive any rights under previous license agreements with fournova for Tower and unconditionally accept that your license for the use of current and previous copies of the Tower software shall be exclusively governed by the terms and conditions of this Agreement. I. LICENSE GRANT fournova may, at its sole discretion, grant you a Beta License, a Trial License, a Single User License, a Multi User License, a Site License, or a Not for Resale (NFR) License. If you have not purchased or otherwise rightfully obtained a Single User License, a Multi User License, a Site License, or a NFR License for Tower, or if you are not participating in the Tower Beta program (II), the Trial License Terms (III) are applicable to your use of Tower. The Trial License Terms are also applicable to any usage of Tower by you that is not covered under any other licenses you may have. The Beta License Terms (II) are applicable if you are participating in the Tower Beta program. The Single User License Terms (IV) are applicable if you have a Single User License. The Multi User License Terms (V) are applicable if you have a Multi User License. The Site License Terms (VI) are applicable if you have a Site License. The NFR License Terms (VII) are applicable if you have a NFR License. The General Terms (VIII) are applicable in all cases. II. 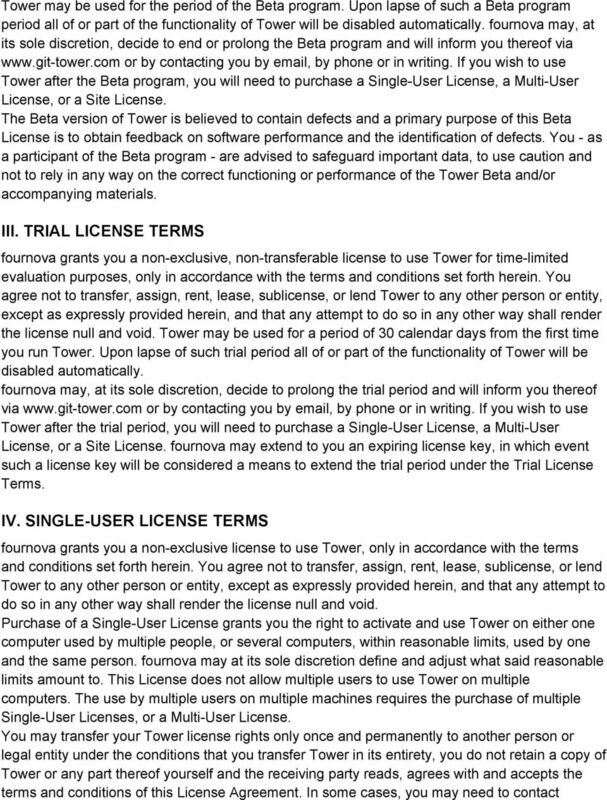 BETA LICENSE TERMS fournova grants you a non exclusive, non transferable license to use Tower for the time of the Beta program only, and only in accordance with the terms and conditions set forth herein. You agree not to transfer, assign, rent, lease, sublicense, or lend Tower to any other person or entity, except as expressly provided herein, and that any attempt to do so in any other way shall render the license null and void. 3 fournova to complete the transfer. 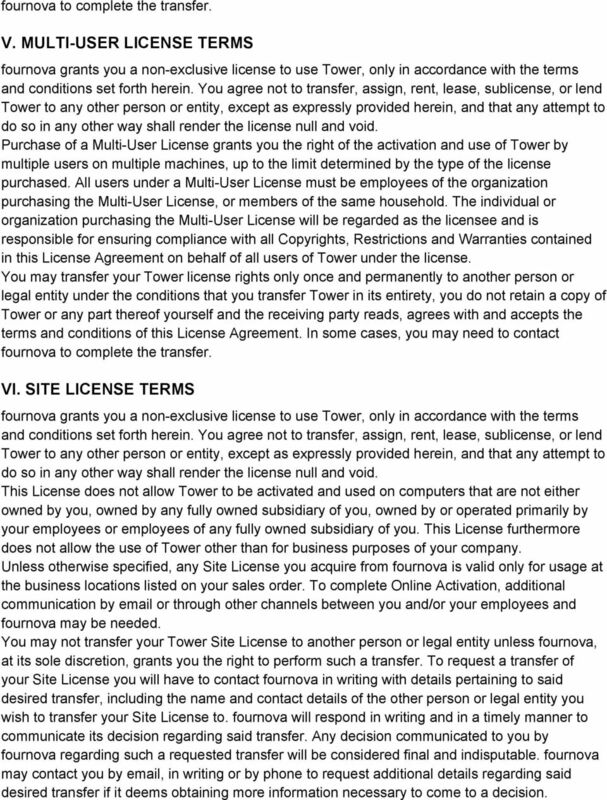 V. MULTI USER LICENSE TERMS fournova grants you a non exclusive license to use Tower, only in accordance with the terms and conditions set forth herein. You agree not to transfer, assign, rent, lease, sublicense, or lend Tower to any other person or entity, except as expressly provided herein, and that any attempt to do so in any other way shall render the license null and void. Purchase of a Multi User License grants you the right of the activation and use of Tower by multiple users on multiple machines, up to the limit determined by the type of the license purchased. All users under a Multi User License must be employees of the organization purchasing the Multi User License, or members of the same household. The individual or organization purchasing the Multi User License will be regarded as the licensee and is responsible for ensuring compliance with all Copyrights, Restrictions and Warranties contained in this License Agreement on behalf of all users of Tower under the license. 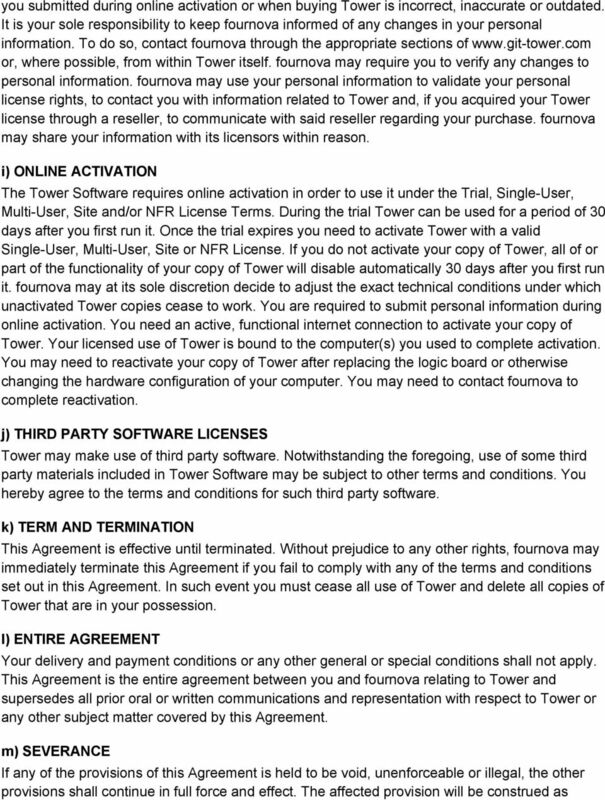 You may transfer your Tower license rights only once and permanently to another person or legal entity under the conditions that you transfer Tower in its entirety, you do not retain a copy of Tower or any part thereof yourself and the receiving party reads, agrees with and accepts the terms and conditions of this License Agreement. In some cases, you may need to contact fournova to complete the transfer. VI. 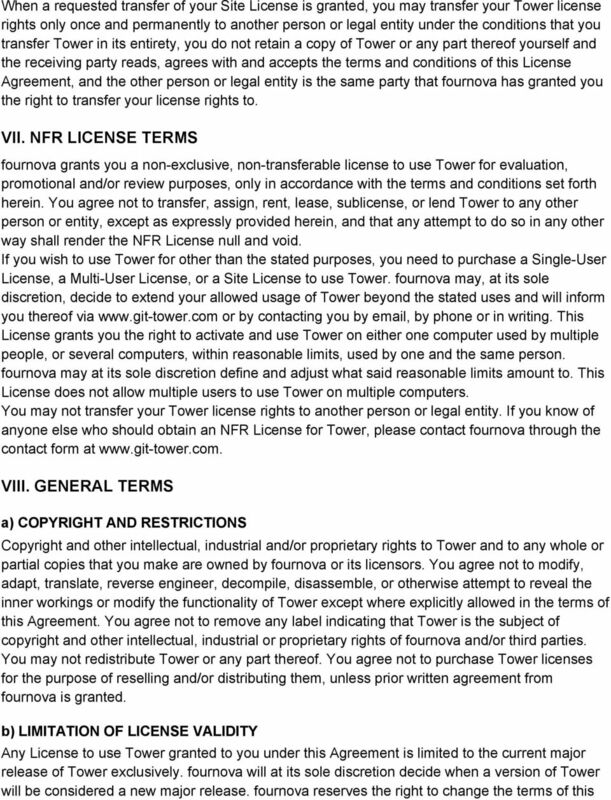 SITE LICENSE TERMS fournova grants you a non exclusive license to use Tower, only in accordance with the terms and conditions set forth herein. You agree not to transfer, assign, rent, lease, sublicense, or lend Tower to any other person or entity, except as expressly provided herein, and that any attempt to do so in any other way shall render the license null and void. This License does not allow Tower to be activated and used on computers that are not either owned by you, owned by any fully owned subsidiary of you, owned by or operated primarily by your employees or employees of any fully owned subsidiary of you. This License furthermore does not allow the use of Tower other than for business purposes of your company. Unless otherwise specified, any Site License you acquire from fournova is valid only for usage at the business locations listed on your sales order. To complete Online Activation, additional communication by or through other channels between you and/or your employees and fournova may be needed. You may not transfer your Tower Site License to another person or legal entity unless fournova, at its sole discretion, grants you the right to perform such a transfer. To request a transfer of your Site License you will have to contact fournova in writing with details pertaining to said desired transfer, including the name and contact details of the other person or legal entity you wish to transfer your Site License to. fournova will respond in writing and in a timely manner to communicate its decision regarding said transfer. Any decision communicated to you by fournova regarding such a requested transfer will be considered final and indisputable. fournova may contact you by , in writing or by phone to request additional details regarding said desired transfer if it deems obtaining more information necessary to come to a decision. 7 limited to the extent necessary to be consistent with and fully enforceable under the applicable law. 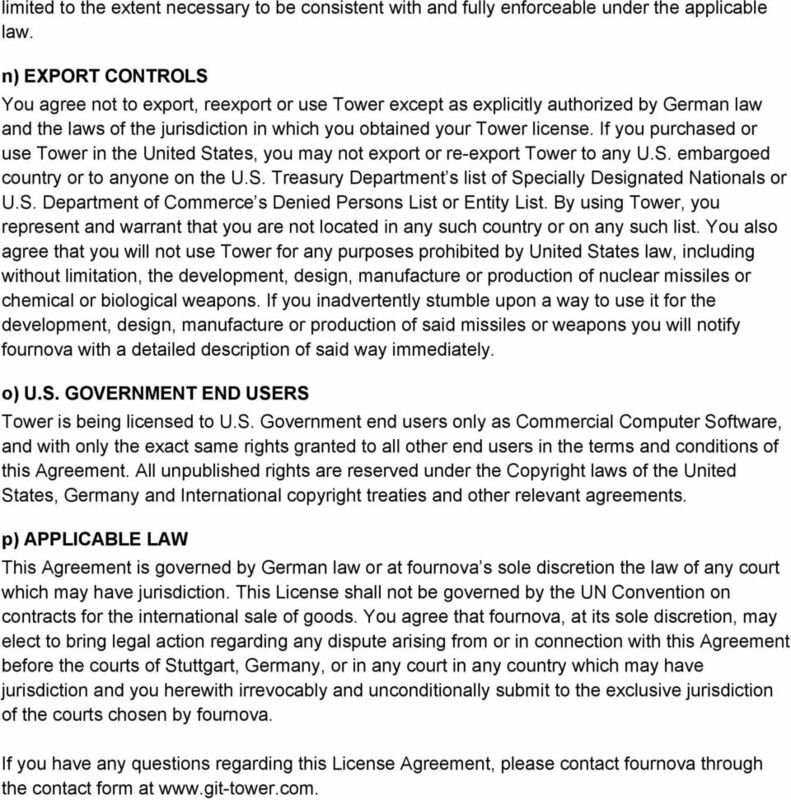 n) EXPORT CONTROLS You agree not to export, reexport or use Tower except as explicitly authorized by German law and the laws of the jurisdiction in which you obtained your Tower license. If you purchased or use Tower in the United States, you may not export or re export Tower to any U.S. embargoed country or to anyone on the U.S. Treasury Department s list of Specially Designated Nationals or U.S. Department of Commerce s Denied Persons List or Entity List. By using Tower, you represent and warrant that you are not located in any such country or on any such list. You also agree that you will not use Tower for any purposes prohibited by United States law, including without limitation, the development, design, manufacture or production of nuclear missiles or chemical or biological weapons. If you inadvertently stumble upon a way to use it for the development, design, manufacture or production of said missiles or weapons you will notify fournova with a detailed description of said way immediately. o) U.S. GOVERNMENT END USERS Tower is being licensed to U.S. Government end users only as Commercial Computer Software, and with only the exact same rights granted to all other end users in the terms and conditions of this Agreement. All unpublished rights are reserved under the Copyright laws of the United States, Germany and International copyright treaties and other relevant agreements. p) APPLICABLE LAW This Agreement is governed by German law or at fournova s sole discretion the law of any court which may have jurisdiction. This License shall not be governed by the UN Convention on contracts for the international sale of goods. You agree that fournova, at its sole discretion, may elect to bring legal action regarding any dispute arising from or in connection with this Agreement before the courts of Stuttgart, Germany, or in any court in any country which may have jurisdiction and you herewith irrevocably and unconditionally submit to the exclusive jurisdiction of the courts chosen by fournova. If you have any questions regarding this License Agreement, please contact fournova through the contact form at tower.com. EGENIX.COM COMMERCIAL LICENSE AGREEMENT Version 1.1.0 1. Introduction This License Agreement is between egenix.com Software, Skills and Services GmbH ( egenix.com ), having an office at Pastor-Loeh-Str. THE SOFTWARE MAY NOT BE SOLD, TRANSFERRED, OR FURTHER DISTRIBUTED EXCEPT AS AUTHORIZED BY LICENSOR.